In early days, Muskoka was built on fur trading, forestry (both logs and tan bark), farming (reason for the Muskoka /colonization Road) and water. Water for hydraulic power to turn the wheels of industry (saw mills, grist mill, woolen mill). Water for hydro electric energy, water for transportation and water for recreation. The falls were the reason Bracebridge grew when many other Muskoka settlements did not. North Falls, (as they were first called) was the end of navigable water on the Muskoka River and the best place for the Muskoka Colonization Road to cross the North Branch. 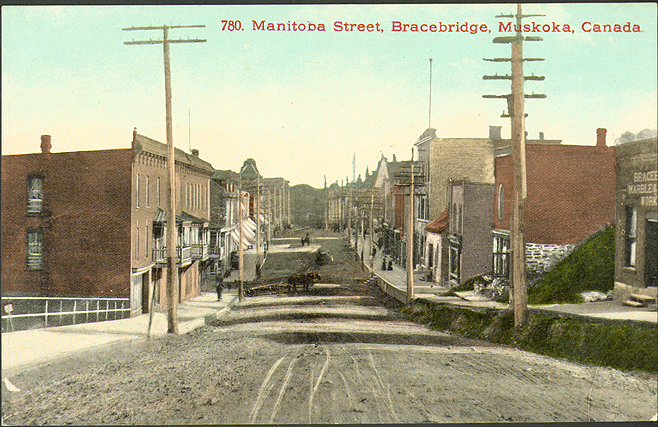 The junction of road and water thus formed was the nucleus of Bracebridge. 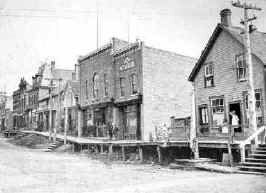 A village in1875 and a Town of 1889, Bracebridge is the official business, and very nearly the geographic, center of Muskoka. The Muskoka Lakes first appear on a map of 1792, originally surveyed by British Army Engineers. Named after a Chippewa Indian Chief whose people camped along the shores of the Muskoka River. Trappers and fishermen frequented the region as early as 1840. Designated as an agricultural area, the hills and rocky terrain resisted the efforts of the early farmers, and with the exception of a few fine farms, Muskoka remained primarily a hunting and fishing paradise. Settlers first began to enter the region with the building of the Washago Road in 1858, and the greatest influx followed ten years later with the incentive of the Free Grants and Homestead Act. Designed to encourage immigration, this Act offered would-be settlers 100 free acres, and was widely promoted in the United Kingdom. 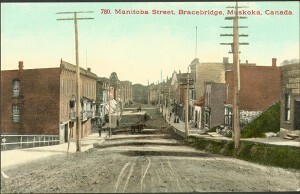 The resultant infusion of settlers from England, Ireland and Scotland saw Bracebridge grow rapidly to become the center of this developing district. Commerce boomed as logging and timber operations fed the growing economy and opened the doors for finance, service and merchant enterprises to establish. The first railroad appeared in 1857, built to a terminus in Gravenhurst and then extended northward to Bracebridge and Huntsville accommodating the awakening patters of trade and settlement. Where the tracks stopped at water’s edge, a fleet of steamships took over, plying the idyllic waters of Muskoka and connecting the business hub to a network of hamlets to the west and north. Since the second world war, Bracebridge has benefited greatly from the installation and expansion of a modern airport, super highways and world-class transportation and communications networks. The charm of traveling to the unparalleled beauty of Muskoka aboard steam trains and steam ships is a prized part of the heritage of Bracebridge. But today’s easy access to the markets of the world readily affirms that the economic promise of the future is now well within reach from the magic of Muskoka.